The multi-million dollar remake of Darling Harbour is imminent with site preparation works already underway. 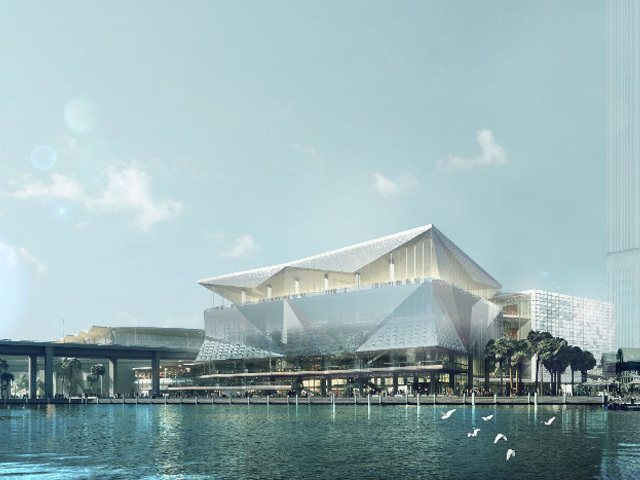 Set to revitalise the iconic precinct, the project will see the demolition of the existing Exhibition and Convention Centre and creation of a new International Convention Centre (ICC) Sydney. As well as a convention facility capable of holding four concurrent events with up to 8,000, 2,500, 1,000 and 750 delegates respectively, the new centre will feature 40,000 square metres of exhibition space, more than 40 meeting rooms and an 8,000-seat high class entertainment centre. In addition, a new neighbourhood with around 1,400 apartments which will become home to 2,000 people with high-tech businesses, apartments, student accommodation (1,000 students), shops, cafes, restaurants and a new city square will emerge progressively at the southern end of the precinct. Describing the proposed facilities as the ‘newest, biggest and best’ in Australia, acting state premier Andrew Stoner said Sydneysiders will see up to 10 cranes dot the skyline over the next three years for the project, which will generate $5 billion during the next 25 years and provide as many as 3,700 construction jobs – 1,600 of which will be on the core facilities alone. “Today we are one step closer to delivering the most exciting transformation of Darling Harbour in a generation,” he said upon finalisation of the deal last week. Following the preparation works, construction is set to start early next year, with new facilities set to open late in 2016. Aside from Lend Lease, other participants in the Darling Harbour Live consortium include Capella Capital (Lend Lease’s infrastructure development business), AEG Ogden and Spotless. While Lend Lease will design and build the facilities, AEG Ogden will be the operator and Spotless will be the facilities manager. The project was granted approval by the NSW planning department in August.